This course takes place at Wagtail International School of Excellence in North Wales. The course is designed to give you a complete range of skills, understanding, and knowledge to carry out explosive detection dog searches in an operational environment. Includes searches of buildings, venues, vehicles, open spaces and more. 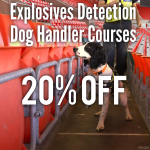 To celebrate the success of Wagtail’s sister company, Event Detection Dogs, we’re offering 20% off our Explosives Detection Dog Handler Courses. This reduces the price from £3995 down to £3196 for the two modules. The Wagtail Award in Explosive Detection Dog Handler is a delivery only learning programme written and owned by Wagtail and endorsed by Highfield Awarding Body of Compliance (HABC). The course takes place our North Wales Training Centre which is accredited by HABC. Service and ex-service personnel, eligible for the MOD’s Enhanced Learning Credits (ELC) Scheme, can use their Credits towards funding this course. The Explosive Detection Dog Handler course offered by Wagtail UK Ltd is designed to give the student a complete range of skills allowing them to operate in any peacetime environment either in the UK or overseas. The course has been specifically designed to give you the skills needed to conduct credible explosive detection searches irrespective of environment or client. It will enable learners to work as an explosive detection dog handler either independently or as part of an organisation. In a world which is becoming increasingly volatile with terrorist methodology changing rapidly, we endeavor to deliver a course which relates to current and evolving circumstances and prepares successful candidates for employment in an ever-changing climate. Our courses do not require prior dog handling experience. We only take fully trained dogs on our courses and would need to assess your dog prior to the start of the course. If you do not have a trained detection dog you would be able to use a Wagtail UK dog for the duration of the course. There are no prerequisites for this qualification however it is advised that learners have a level 1 in English (speaking and listening). If you are unsure about your suitability for a course then give us a call and we will give you advice over the phone. The full duration of this course is 26 days which is broken down into 2 modules, each consisting of 13 days. Both modules need to be undertaken to complete the course. The total number of guided learning hours is 160. The course is delivered using a blend of learning styles to suit all candidates and is assessed through a rolling programme of observed assessments and portfolio assignments. The course incorporates prescribed lesson plans to ensure all learning objectives are achieved but also incorporates a whole week of search work where lessons and objectives are tailored to the individual learner. This allows the student to focus on areas most pertinent to their learning journey giving additional support where needed. The course is delivered by our expert instructors who have extensive knowledge and experience in the field, and are currently active within the industry. This ensures that students only receive information which is relevant, current and client led. The hostile environment element delivers generic information and skills including techniques, tactics, and procedures suitable for high-risk locations. Subjects include IED Threat Assessments, Terrorist MO, IED counter measures, tactical awareness, advanced search techniques and much, much more. At the client’s request, this week can be tailored to suit specific geographical locations based on the known or perceived threat. The total cost of this course (module 1 and module 2) is £3995. We are currently offering 20% off this price, reduced the cost down to £3196. This is an ELC approved course for which service personnel (both serving and former) may be eligible for funding. Please visit the ELCAS website to check your eligibility. Self-catering accommodation is available at recently renovated Wagtail House in Prestatyn. We are able to offer discounted rates of £25 for a single room and £45 for a double room per night. Please click here or call 01745 561166 for further details. This course can also be delivered as a NASDU Certificate for Explosive Dog Detection Handler.